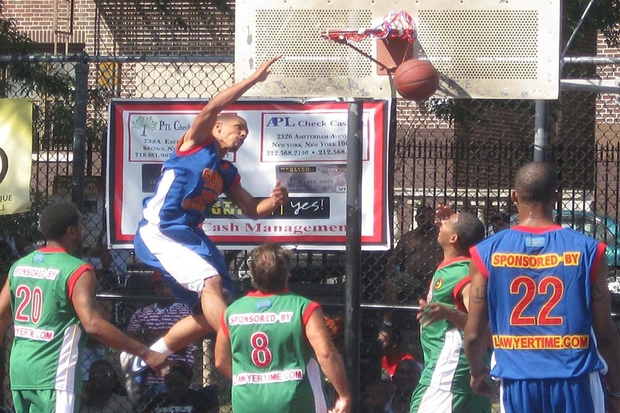 THE BRONX — To say that Bronx resident Dexter Gardiner had a difficult 2006 would be a massive understatement. His mother died in January; his sister passed away in June; and in July, his twin brother, two nephews, niece, brother-in-law and brother’s best friend were all killed in a car accident. “All the ‘J’ months in the year were just rough,” Gardiner said. The string of tragedies left the 49-year-old feeling like he wanted to give up on life, but the one thing he found comfort in was a memorial basketball tournament he organized in honor of his family. Gardiner described it as a way to pay tribute to his lost relatives through a game they loved and a way to help him deal with their deaths. The tournament is now in its 10th year and has greatly expanded since its inception, attracting about 1,000 people and teams from places including Philadelphia and Mississippi. NBA players including John Starks and Ben Gordon have attended in the past, and Gardiner said Danny Green from the San Antonio Spurs might make an appearance this year. The event will take place on Aug. 15 and 16 in St. James Park, starting at noon and ending at 7:30 p.m. on both days. It will consist of four games on Saturday and four games on Sunday, and there is virtually no age limit for players, Gardiner said. "The tournament is basically open roster," he said, "so you could be 16 to 40 or 50." This will also be the first year that the tournament includes a girls basketball game, pitting a team from Long Island against a team from Harlem. The winning team for 2015 will receive trophies that Gardiner promises are "beautiful," and the tournament will include a giveaway of 350 backpacks filled with school supplies and a drawing for two iPad minis and 20 tablets. The tournament, sponsored by the law firm Gersowitz, Libo and Korek, P.C., also features a memorial service for a family that lost someone to a tragedy. This is to let them know that they are not alone in their grief, according to Gardiner. "There are people that care, you know," he said, "because I’ve been through that, and I know how much it hurts, and I just want to give back." Gardiner Foundation, a non-profit he set up in 2006 shortly after his family's car accident, organizes other charity events in addition to the tournament. The group also holds a turkey giveaway at Thanksgiving and organizes a mentoring program to help people between ages 14 and 29 deal with the stresses of peer pressure, Gardiner said. It gives away scholarships as well and has grown from giving out one $500 award in the tournament's second year to giving out five $1,500 awards for incoming college freshmen this year. Donnell Henderson is one of those benefactors. He and his wife have three children, and each of them received a scholarship from the Gardiner Foundation to help pay for college. "During the time that they were going to college, we were a little financially tight," he said, "and the foundation helped us get them some things that they needed." Dominique Henderson, the Hendersons' youngest child and a 20-year-old student at the Alvin Ailey Dance Theater, said the scholarship was also a huge confidence boost for her as she prepared to go to college. "It was really, really encouraging," she said, "and it really helped out with my first year." Donations to the Gardiner Foundation can be made here.